You’d be forgiven for thinking that Tom Baker makes rock ‘n’ roll suits. After all, that’s what he’s known for, that’s what he is pictured wearing and that’s what you see if you look through his window on D’Arblay Street, Soho. 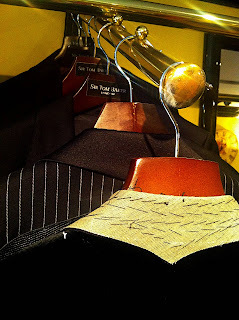 But about 70% of the bespoke is business suits. 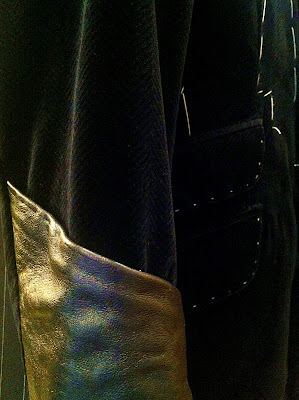 Blues and greys, worn by financiers, oil traders and the like. 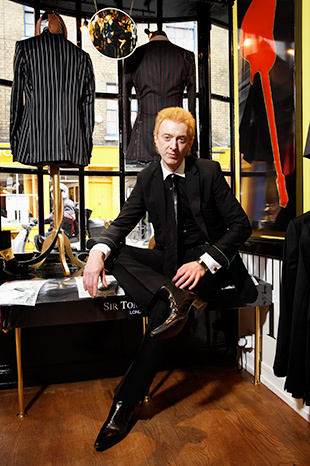 “Men like going to somewhere that isn’t the traditional Savile Row, somewhere with perhaps a hint of danger,” he tells me. 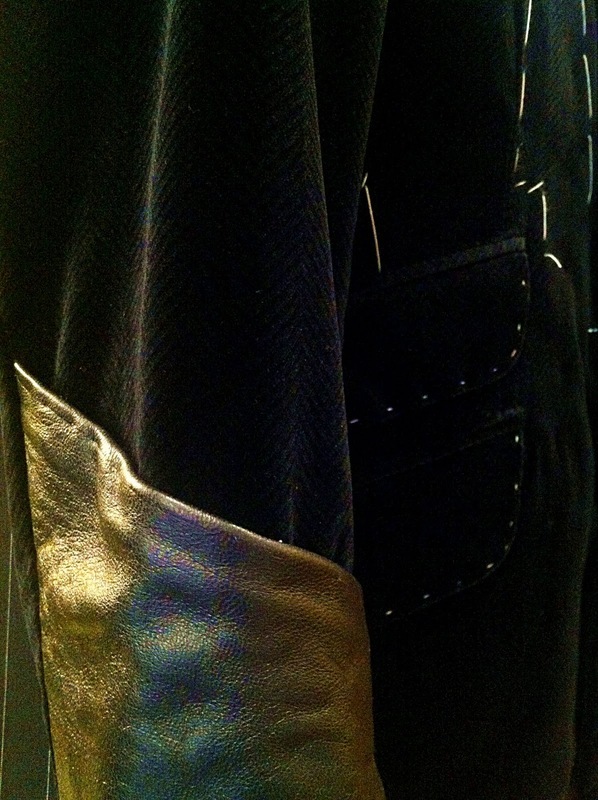 They also like to incorporate some of the innovative details Tom includes on his ready-to-wear suits (though RTW is only about 20% of business). These include collars with a point at the back, as shown in the baste pictured, asymmetric outbreast pockets and fancy linings. For the next step up in adventure there’s turn-back cuffs, covered buttons and asymmetric hip pockets. While I was there Tom fitted an oil trader who came in on the recommendation of two friends. Both had their business suits made by Tom, though they had each also had more daring jackets made – one a tailcoat for his wedding and the other a black velvet jacket. Rock ‘n’ roll is a great selling point, but it’s not what people are buying. 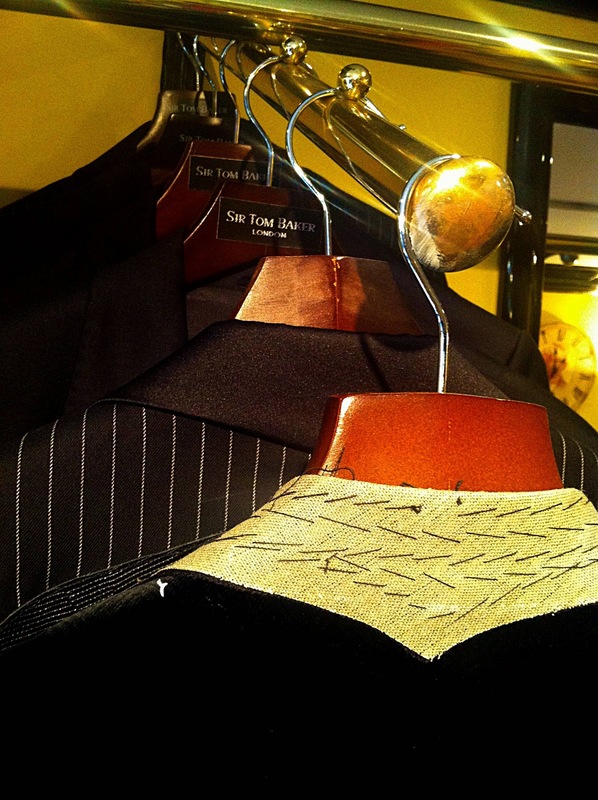 Tom trained at Hardy Amies, as a tailor, but today he does mostly fitting and styling, only getting involved in the cutting or tailoring when particularly unusual cuts need to be monitored to get the shape right. Having had upstairs premises on Berwick Street since 1996, he moved into this ground floor shop three years ago, which has helped with passing trade. And there’s room for two workshops downstairs, with other premises still on Berwick Street. Bespoke starts at £2200 and RTW at £650. While most at Tom Baker is not to my taste, I can certainly see the appeal to men in their thirties looking for a different approach to bespoke. And if I was researching original details to add to a cocktail suit, I’d go and pick his brain. You can follow the discussion on The very conservative Sir Tom Baker by entering your email address in the box below. You will then receive an email every time a new comment is added. These will also contain a link to a page where you can stop the alerts, and remove all of your related data from the site. However, I do appreciate the creative imagination at work here. I neglected to mention the stunning portrait photo. An exquisite formal composition, not unlike those of the great 17th – 19th century masters. Please let us know who took this shot. Actually more of a Rennaissance portrait. I stumbled upon this website looking for some contact details after I lost my phone – Tom has made my suits (business blues and greys) for a few years now and I have to say they’re an absolute joy to wear. 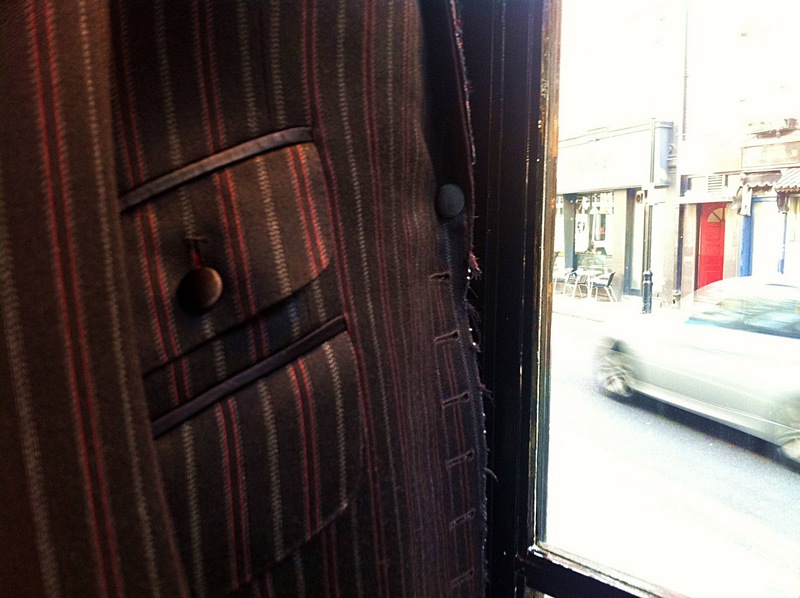 Tailors are usually a life time commitment and whilst I used to staunchly be a Kilgour man, I stumbled upon his work through a friend and decided to have a chat. Tom has such an eye for detail and being a tall man himself understands the traumas we go through when buying clothes! His celebrity book is very impressive, especially the TV types, so whilst most of his customers may well be people like me who sit at a desk or on a plane for most of our lives, his work will be far more widespread than you might think! Hi. I’m looking to order a bespoke overcoat. Would you recommend Tom Baker? He’d do it at a much better price than the Savile Row tailors. 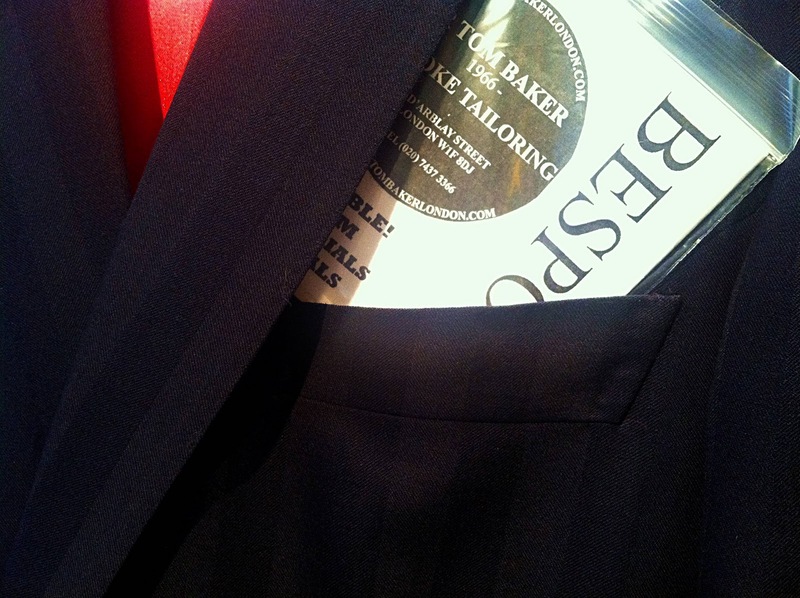 And if one were to go with Tom, what would you recommend that I stress on during the bespoke/fitting process?